Recommended to: Readers who are fans of the Iron Codex series. The Mirrored Shard opens on an Aoife much different than before. After everything that has brought her to this point in the series, she is a shell of her former self. With Dean gone, the world descending into madness, and her essentially being the cause for it all, I can't deny her demeanor was easy to understand. Still, I instantly missed the Aoife from the other stories. Strong and witty Aoife. I crossed my fingers that things would resolve themselves, and read on. Now, what first drew me into this series was the world building. Kittredge's writing would flow onto the pages, and I was so drawn in to Lovecraft that I couldn't look away. She built a world where I was able to visit an airship and meet some Fae in the same breath. 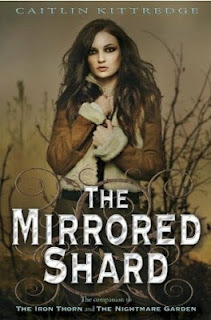 So imagine my chagrin when I realized that The Mirrored Shard was lacking the descriptive writing I fell in love with. Actually, it is still here. Just less of it. I wanted more of the eerie Deadlands, more of the cold and calculating Fae. Which brings me to my final issue, and in truth the reason why this book garnered fewer stars than the previous two for me: the plot. In previous books Aoife's adventures have always been daring and grand. Filled with danger, narrow escapes, and requiring quick thinking on her part. I loved the camaraderie between the characters. In The Mirrored Shard, I felt like a lot of that was pressed into the background. Aoife is so focused on getting Dean back that she acts much like a petulant child most of the time. The Fae, the Old Ones, everything that kept the story moving, is shoved back for Dean's rescue. It just felt off. That's not to say that I didn't enjoy this book. There were portions that shone for me, and others that were slow to get through. I will admit that I was very glad to see everything finally wrapped up neatly. I wouldn't say no to another book, especially because I'd love to see where things go with Aoife. For now, I'll say goodbye to this series with a smile on my face. Thank you to Caitlin Kittredge for allowing me to escape into Lovecraft. I can't wait to see what comes next.